In my current role as learning & ICT coach, I use the cultural forces as a filter for thinking and development. They can be used to notice and name forces in a situation. Which forces are being influenced with this? Which force(s) might be in high or low resource? How can we make sure the influence is positive? How can we help make it easier to do better things? Click here to download them as a pdf. Most of these are hosted on Ron’s website. Our role as teachers and parents is to provide an intellectual apprenticeship for learners. As Ron mentions in the video below, via Howard Gardner, their time with us should be “time well spent”. This interview outlines some key ideas from the Cultures of Thinking project, and is well worth listening to. Since moving to WAB I have fallen in love with Libguides for curation and presentation of information and resources for colleagues and students. On this Pathfinder, I’ve compiled everything I can find for CCOT, MTV and other PZ resources. Categories: Approaches to Learning, Educational Philosophy, Inquiry, Inspiration, Middle Years Programme, Professional Development | Tags: Cultures of Thinking | Permalink. Five years ago I was starting to become concerned with the difference between marking and feedback. What was making a difference to my students’ learning and was the effort I was putting into detailed marking worth it in terms of their improvement? 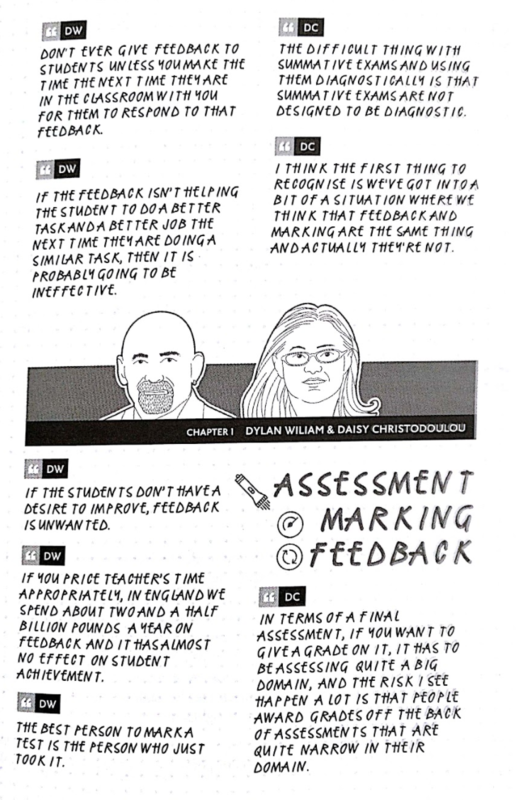 In reading Hattie’s Visible Learning for Teachers, Wiliam’s Embedded Formative Assessment and the pdf of The Power of Feedback (Hattie & Timperley), I developed a four-levels feedback template for use on student work. This post is to share an updated version – I still really like this method of giving timely, actionable, goal-focused and student-owned feedback. It definitely saves me time, but puts the focus of feedback on what’s most important for the student to take the next step. I’ll keep updating, editing and adding to this post. When giving feedback on a piece of work, I paste this at the top of the student’s assignment, give some comments in the work and check their self-assessed rubric. Before we open individual feedback, I summarise whole-class feedback. A copyable GoogleDoc version of the grid (and teacher explanation) is here, and to export it as pdf, click here. Why present feedback this way? Feedback is timely, actionable and needs to be more work for the learner than the teacher. Clarity of achievement so far: goal-referenced, tangible & transparent. Timely. Using a system like this saves time in grading/giving feedback, makes it more accessible to digest (is user-friendly) and can be easily reviewed for the next time the student works towards similar goals. Feedback first, then grades. Not presented together, to enforce student reflection & action. Goals and outcomes need to be clear – do students & teachers have a shared understanding of what success looks like at different levels of achievement? Feedback needs to be ongoing. Students are taught to self-assess in the drafting stages and feedback (not grading) given on the drafts with plenty of time to take action before submission. Students self-assess before submission. Even better – they can peer-assess and give feedback. If tasks are differentiated, this does not present a collusion challenge. Check the assignment, making comments only on actionable next steps – not an overwhelming number, as this can increase the perceived “gap” for students. Students who want and will take action on very detailed marking can request this in follow-up. Summarize feedback in the grid: task-level, process level and self-regulation level. Record grades out of sight of student. Students read their feedback: table and comments. Students synthesise this into a “feed-forwards” note to self. Showing this to the teacher and a shared agreement on the next steps releases the grade, not before. Next time the task type is attempted, the first thing students do is open the feedback and set achievable, specific goals to “level up” based on the feedback & feed forwards. We made explicit the reason for doing this and I keep no secrets about the “magic” of learning from students. I explain and demonstrate what works in learning and why we do things this way. Most students like seeing the next steps really clearly. We’re not all aiming for top levels right away – we’re aiming for progress upwards. We talk about “the gap” a lot, and our quest to close the gap in prep. I already know what the grades are likely to be, as we invest time in class for drafting, feedback and conferencing. I expect students to show their work and take action on feedback. I will happily take a piece of work back and sit with a student, giving really detailed marking and justification if they request it. This rarely happens and it is usually one or two who are working at the very top of the rubric. This is far more efficient and effective doing acres of marking for large classes, the bulk of which won’t have an impact. Categories: Approaches to Learning, Assessment, Differentiation, Hattie / Learning Impacts, Middle Years Programme, Science Teaching, Understanding Learners & Learning | Tags: Feedback | Permalink. I really enjoy parent-student-teacher conferences. (I’d rather do more of these and less report writing, but that’s a different post.) Even with a limited time-slot (my last couple of schools have been 10mins), we have an opportunity to strengthen a home-school connection, build a relationship with families and really put the learner and learning front and centre. I love being a science teacher, and parent-student-teacher conferences are a prime opportunity to share that. Just because it’s high school, doesn’t mean it needs to be too serious. Over the last five years or so of teaching, I’ve set up recent investigations or phenomena for students to demonstrate, explain or solve for their parents. The conference begins with a warm introduction, a check on languages used and then the student demonstrates the phenomenon to their parents. I keep some prompts and visuals around the table, to be used as the conversation develops. I don’t prep students – I want to see how they go, and how much of their learning they can make visible to the parents. In this part of the conference, the students and parents can communicate in their most comfortable language. It’s important to me that this is a positive experience and gives me a couple of minutes to see how they interact. If a (rare) difficult conversation needs to follow, I know better how to judge my message. In most cases, we build on the observations, and follow our own little lines of inquiry. Occasionally I pick up some new science vocab in my students’ home languages. With multilingual students we always talk about how language development is supported in the class. Of course, parents to come to conferences to hear how their child is doing. That’s great, and we work on the basis that if something was wrong, they’d already know; there should be no surprises in a report card or parent-teacher conference. How can they use our resources and rubrics for moving up? Do they understand the best-fit approach and use of command terms? How do our “feed-back feed-forwards tables” work for focusing on what’s important and what “note to self” is there for next time? What are they struggling with and how can I help? As parents we want to know our child is cared for and is learning. We want to know how we can support them, and we want to trust you as their teacher. This is how I feel as a parent-educator, and it is echoed in many interactions. Taking this opportunity to celebrate their child and their learning is more than just a little fun – it’s who we are. Occasionally I’ll provide parents with some online resources, or mention some of Ron Ritchhart’s “9 Apps for Parents” or “10 (+1) things to say to students every day” for “at home” discussions. Next time I’ll put out some of the recent multilingual understanding map resources he shared as we reflect on the year in learning. Might seem simple, but what an impact. "9 apps for #parenting a culture of thinking". Back in 2016-17, I worked with a group on a project to connect the IB ATL Skills to the ISTE Standards for Students and AASL Standards, to generate our own school’s Instructional Technology & Information Literacy (ITIL) Standards. CA is a three-programme IB school (PYP-MYP-DP). The goal was to create an alignment of the ISTE and ATL skills that would allow us to put the language of ATL first in conversation and collaborative planning with teachers, but to build on the excellent work and resources of ISTE in our co-planning and tech integration. At the same time, it brought together a range of people responsible for working with teachers on their units of inquiry, and built a stronger connection through the library. This group included tech integrators, librarians and Liz Durkin (@lizdk), who along with being Associate Secondary Principal is now Ed Tech Director. I was in the role of MYP Coordinator and PK-12 Director of Learning. Planning took place in the library, and by the end of the 2016-17 year we had a framework to get started on, with some spaces for further development. This post outlines some of the processes, decisions and next-steps for the project. This was a big project, starting almost two years ago, and I’m sure there will be parts I’ve forgotten, but now it’s the summer, there is some time to reflect and capture thoughts. A section of the resulting spreadsheet, showing the outcomes. This fits in with a longer-term school-wide goal of better embedding the IB ATL skills framework in the school, and we were wary that adding another new set of language for teachers to use could create a block to implementation. We have kept the ISTE Standards and Strands as published, but unpacked each strand into a cluster of ATL skills that we saw as contributing to the realisation of the skill/strand. Later on, ITIL co-planners as ‘gatekeepers’ of the ISTE standards would be able to articulate the connections. Also, as the IB MYP ATL skills framework was being developed in 2013-14(ish), it was clear that some skills were directly derived from 2007 ISTE NETS. With the 2016 ISTE for Students update, and seeing future directions of ATL in PYP and DP, we saw a timely opportunity to get to work. This allowed for the stronger connection of the libraries as a research/ATL centre, but also made explicit the reading role of the library, referring to the AASL framework. The structure is the same, with standard, strands and ATL skills. We included, but are yet to develop (it’s in next year’s goals) a “mother tongue” strand to work out how the library can support ATL development through mother tongue and language acquisition support. As we went through the collaborative process of unpacking the ATL skills against the strands (first on paper, then on the spreadsheet), we spotted some opportunities to adapt to better suit our own context, or to generate custom ATL skill descriptors to better represent the meaning of the ISTE strand. We coloured these differently (blue in the example to the right), as a reminder that as specialist skills these are very unlikely to be covered in other classes and so will need to be found a ‘home’ in the curriculum. This was an attempt to align the four levels fo mastery of the ATL skills with the ISTE standards, to show our expectations of learners over time. We started with the third column (practitioner/demonstrating) as “meets expectations” and determined a statement of a competent student. Very quickly we realised the ISTE standards statements, with minor modification, fit the bill. We then developed band 2 (learner/developing) and band 1 descriptors (novice/beginning) as steps towards competence. Finally we decided to leave the fourth column blank and ‘aspirational’ as an opportunity for inventive and diverse high-level implementations to be opened up. After all, tech moves fast and we don’t want to cap creativity with artificial descriptors. See Cult of Pedagogy’s Single Point Rubric post for more discussion of this. Four levels of description. Aim for green, work towards it, aspire beyond. Decision 5: What skills do we need to know? Although this project developed a strong connection between ISTE and ATL for the purposes of EdTech integration, we still needed to know what skills teachers and students need to know to be successful in our high-tech school. A supplementary process identified a “CA Tech Skills” inventory for orientation/support to help people get up and running successfully. This was a really enjoyable curriculum project and it worked well as a tool to bring co-planners and integrators from different sections of the school together. Next steps, of course, are to further implement the ISTE standards through embedding ATL into units and instruction via the library-tech and co-planners. Over the 2017-18 school year work began on this, and Liz Durkin expertly led the TALT & Tech Reps group in adopting the RAT model (replace, amplify, transform) of tech integration, identifying lots of amazing uses of tech in the school and spreading them through celebrating and sharing success. Over the next year, things will really click into place, including the work being done on digital wellbeing. As I move on to a new role as learning/tech coach at another school, I look forward to continuing these discussions and collaborations. Categories: Approaches to Learning, Ed Tech, Middle Years Programme | Permalink. Here are some general resources for helping students get oriented in the MYP. Click here to open full-size in GoogleSlides, with instructions in the speaker notes. The goal here is to provide some ideas and printables that can be used to help initiate students into MYP, in an enjoyable but informative way (and not launching right into “here’s how you’ll be assessed”). Big thanks to Alison Yang for her ideas, discussion and posts (see here and here), and to Lenny Dutton for her creativity. If you have an idea to add, please let me know. I’ve also posted this to i-Biology with some ideas for MYP Science. Categories: Approaches to Learning, Curriculum, Middle Years Programme | Permalink. Over the last few years as a science teacher and coordinator I’ve been thinking a lot about how we might create a culture of thinking that balances vigorous and challenging outcomes with student co-creation (or navigation) of inquiry, particularly where there might be high-stakes terminal assessments looming. The “Curriculum as a compass, not a calendar” metaphor* helps me wrestle with these ideas. This one has been brewing a while and is still pretty drafty, so I reserve the right to edit ;> With so much written about inquiry and edtech in recent years, there is likely little new in here, but writing helps clarify thinking. Also, my kids and I love Moana, hence the images and gifs. *See the “Heritage of the Idea” at the bottom of the post. The Japanese term Tankyuu (探 究), meaning inquiry, journey, quest or investigation, is a nice fit for this idea. It aligns with a pragmatic definition of inquiry, suggesting that there is a journey worth taking, knowledge worth learning and many paths worth exploring. It suggests depth and vigour, a level of sophistication that empowers learning, building on (and feeding back into) a solid foundation for the future. This is no new idea, and has been written about in many different ways. Most recently, in Quest for Learning by Marie Alcock, Alison Zmuda and Michael Fisher, inquiry is presented as a part of a “quest” that is enhanced by effective networks and elements of “gaming” that drive learners. Hop on over here for a review of their book. If we think of inquiry as a voyage, then we might think of curriculum as a compass – map and compass set. As a map the curriculum outlines the destinations and checkpoints, obstacles and viewpoints. The curriculum outlines the “need to knows” in context (national/international standards), but doesn’t dictate the route to take – or the schedule for the learning. There may be well-trodden paths to lead us to tourist hotspots but there might also be areas uncharted, adventures waiting to happen where the questing learner (co-)creates new knowledge, ideas or outcomes. The compass holds “true north”, ensuring that whatever the path taken, learners can find themselves back on track, relatively unscathed. The compass can help the tempered self-regulating learner decide “If I’m here, and I want/need to get there, then I have to ______ .” In the PYP context, you might want to read the ever-great Edna Sackson’s post on “curriculum shouldn’t be linear“. What are the roles of knowledge and skills in an inquiry context? Under this metaphor, we might think of them as the “need to knows” to start the journey: the contents of the voyager’s backpack. What does the explorer need to know and be able to do to set the course? What experiences and provocations can inspire the journey and create the moving force to get going? What do they need to know and be able to do to get going? How will they know they’re making progress and how will they generate feedback to take action on the journey? What are the most effective ways to learn this foundational knowledge, misconception-free, so that they are prepared for the journey ahead? What are the “just in case” lessons or resources that the teacher might have to hand (or workshop with), in prediction for challenges ahead? “Ah, I can see you’re heading up the mountain…. do you have the right rope?“. What are the “just in time” lessons that the teacher might need to prepare, or have at their fingertips, as the journey progresses? How can we spot and take appropriate actions on the little nudges that get the lost wanderer out of the bog? What knowledge might help here, and are they on track? What disciplinary skills are useful here and do they know them well? What approaches to learning skills can drive this forwards? What tools – physical, digital and strategic – might be needed and how will they access them? How much of this is just in case or just in time? How can this connect to other learning, in this quest, other classes or outside? Who can help as journey-mates, experts or co-navigators? Are they holding “true north” and how far off course is OK until we need to step in? So what is the role of the elder in the hero’s quest? Inspiration? Co-creator? Director? The holder of cultural knowledge (curriculum)? Guide? Instructor? Coach? Confidante? Expert? As the adults in the room, with a great weight of responsibility, it is likely to be all of the above. The challenge is knowing who needs what and when, helping our own learners find the joy in uncertainty and the fulfilment of doing the hard work of learning to find our way. Perhaps sometimes, like Moana’s Grandma Tala, we need to transform ourselves, to become Wayfinders and join them on their journey [gif source]. With potentially transformative technologies in our voyagers’ backpacks, our quests have the potential for charting new territories, creating new outcomes and connecting across the map. From productivity to efficiency, creativity to critical thinking, wellbeing to connection, the potential for technologies to really elevate learning is endless, and can amplify (or transform) a knowledge-rich, student-owned learning adventure. Reach out and connect: it’s a rich world of shared learning and collaboration that can give the voyagers access to learning that might not have been possible otherwise. SatNav, as wonderful as it can be, has two main flaws. First, it gives “the answer” quickly, even though it might not be the answer we need (and may sometimes lead down a dodgy path). Second, it can be annoyingly fiddly, dominating your thinking when you should be driving the car. As the teacher it can be hard to resist jumping in with the answer (or an assumption) that steals the opportunity for thought, like a satnav giving shortcuts that miss out on the best part of the journey. Similarly, edtech is not always the solution and even in the age of Google our students need to be masters of valuable knowledge. If surface-level enquiry (looking up simple stuff) is wasting mental energy that could be better put to work on true thinking (inquiry with an “I”), find a more efficient way to teach the basics and move on to better questions. If the adult is getting in the way of the real thinking, step back and listen. If the tech is just a “shiny” distraction, reconsider its worth. Do we really need this side-plot in our adventure? If the tech tool is creating an unproductive struggle (a “clicky-clicky timesuck”), ditch it for something more truly interactive and/or effective. If grades are getting in the way of learning, find ways to separate them from feedback (feedback first, feed-forwards and so on). If the navigators are lost (or antagonistic), teach the teamwork skills that are needed to move on. So there you go. My two cents on curriculum as a compass, inquiry as a quest and ATL skills, edtech and more as navigation tools, using Moana gifs. If you have any thoughts, please add them in the comments below or find me on Twitter. When I heard the phrase “curriculum is a compass, not a calendar“, years ago, it resonated, but I couldn’t remember where I heard it, Found it: it was Aaron Duff (in 2014) – and I’d even made (and forgotten about) a graphorism when this account was on my old handle (@iBiologyStephen), a symptom of years of output littered across the web. Thinking about getting ready to move, my hard drives, blogs and folders are littered with 11+ years of resources, drafts & #EdTech experiments. Some I'd forgotten about, all a labour of love. In a Twitter exchange on #PubPDAsia I tracked down an even earlier use of it (2008), and found a quote in Research on Second Language Teacher Education: A Sociocultural Perspective, edited by Karen E. Johnson, Paula R. Golombek. It’s amazing what focused search strategies can turn up in the context of a rapidly-moving live twitter-chat! Now, as I think more about curriculum development and future adventures in high-quality, learner-driven, vigorous (and knowledge-founded) inquiry, I think about the toolkits and strategies we might put in place. Connecting the pieces of the the programmes (MYP, DP, NGSS etc), along with big ideas and frameworks from Bold Moves, Quest for Learning, Cultures of Thinking, Making Thinking Visible, I move closer to the image of the learner (adult or student) as a Wayfinder. Categories: Approaches to Learning, Inquiry, Middle Years Programme, Understanding Learners & Learning | Permalink.